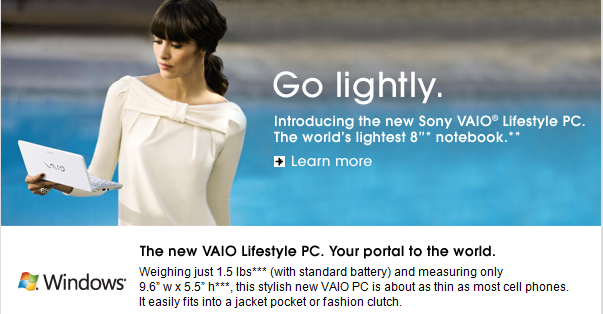 Got this ad today for the Sony VAIO Lifestyle PC, one of the new “netbook” models. I just checked all of my suit / sport coat jacket pockets and none of them are wider than 4.75”. Add the thickness of the machine, and there’s no way they could fit anything wider than 4”. Some overcoats might have outer pockets wide enough to accommodate the VAIO, but a computer stuffed into a pocket like that would probably fall out or be stolen. Just look at the picture. Can you imagine any article of clothing that would have a pocket big enough for that thing?